House book is issued to each household. It lists information about housing, all owners and registered in the housing. An extract from the document is needed for making any legally significant actions with the household, such as purchase, sales, exchange, donation, Testament, entry into the inheritance. Decorate the house book in the office of the Federal migration service on the basis of submitted documents. Buy a house book in any shop selling stationery or the printing. You can also buy house - book directly to the FMS. Present along with the book the house title documents for the property: ownership certificate, if your license is already registered, the contract of sale, certificate of inheritance, donation contract, exchange, etc., if your ownership rights are not registered and you are just going to do it. Get the extract from unified register of state registration of the center, if you get the house book after the registration of ownership rights on or after the commissioning of newly constructed housing. Often house book is issued after the specified actions. Get extract from the BTI of the cadastral passport, will receive a copy of the cadastral plan of housing. If the validity of the cadastral documents has expired and it is valid for five years, you will have to call a technician to inspect on the basis of which you will update the cadastral documents and you will be able to obtain the necessary statement. Write an application to the Federal migration service to populate the house. Please submit all documents received. Immediately complete the application for registration, submit a passport, birth certificate of children. 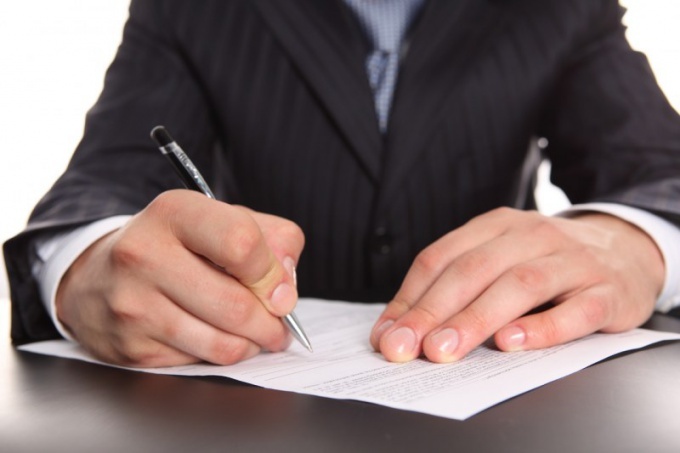 It is necessary to be the owner of the property or have notarized authorization from all owners. The house received a book once, you will pass it when changing the owner of the property. The document will be to provide all the information about the change of ownership, all ever and was taken off the register. On all records you can trace the history of the tenants, who, when was registered and removed from the register and how often to change homeowners. 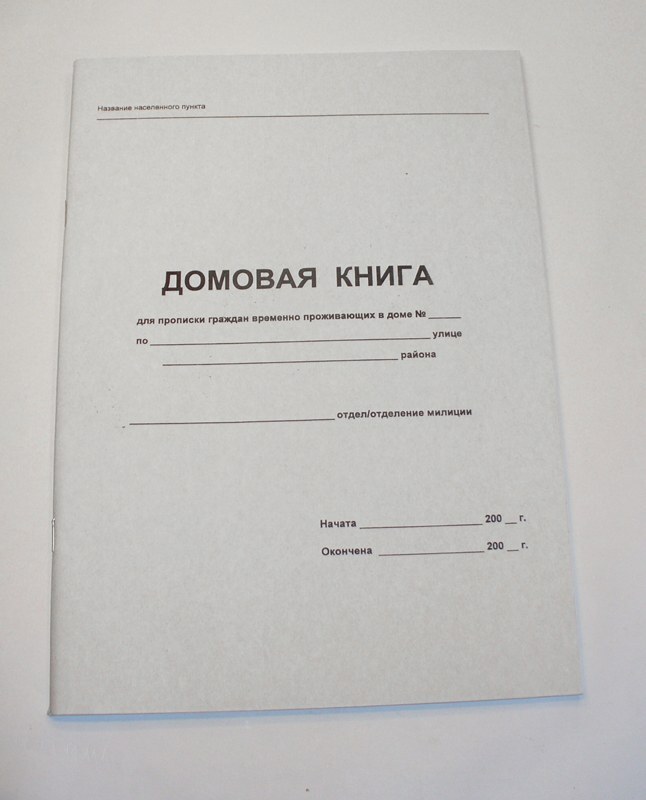 House book kept by each owner of a private house and is presented each time the FMS is in the implementation of the registration and de-registration. House book of houses is kept in the housing Department, if necessary from it an extract is issued. House book is a log, which contains information about owners, and also records all persons ever registered at this address, and, of course, who is registered at the moment. 59. At registration of citizens in residential premises of the private housing stock owned by natural or legal persons by right of ownership, in the absence of the agreement of the owner (owners) of residential premises from the housing Fund of the administering organization to conduct this work, allowed the registration and storage by owners of houses (apartments) of the house (apartment) books in the form N 11 (Appendix N 11 to the Regulations). Domestic (door-to-door) books are maintained on each household (apartment). Passport or birth certificate of all family members, marriage certificate. 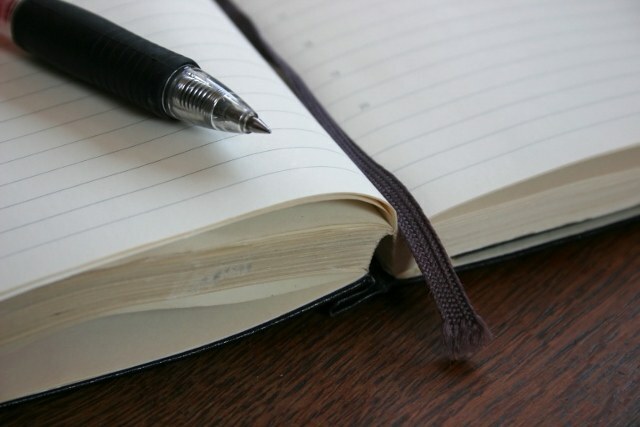 Unfortunately, many issues concerning how to get a house book, who it should be stored (for example, if the housing is shared ownership) and how to solve various problems arising in case of disagreement of the owners, by registration, etc., legislation give a very vague and imprecise instructions, leaving much to the discretion of lawyers. If you experience associated with the book the house of the issues to resolve them in legislative acts, it may be advisable to enlist the help of an experienced lawyer to go to court. After the acquisition of housing or its privatization there is a need to design the house for the implementation of the registration and removal of citizens from the registration registration in a residence. House book is issued by the owner and retained by him. The Stage Of "Preparatory". First of all, purchase the very house book (usually sold in stores when printing). Collect the passports of all registered in the apartment people. Make copies of Certificates of state registration of rights of ownership or any other legal document (a contract for privatization, sale, exchange, gift, certificate of inheritance, court decision) and glue them(her) in the book. Stage "get help". Visit the Department of registration of citizens of your city (the passport office). Will get the information about registered in apartment people (usually issued immediately and free of charge). Help is on the basis of the door-card for presentation to the Department of management of Federal migratory service in your region (city). The Step "Fill-In". Before completing please check your reference house books, which is usually printed on the inside cover of the book. Start filling from the cover, enter the house number, apartment number, street, and name of the body of internal Affairs of the settlement. Go to section III "Registration". Neat legible handwriting fill each row of the table in accordance with the requirements specified on the cover. Enter the details of all persons registered in the apartment in accordance with the received help. The phase "Going to authorities". 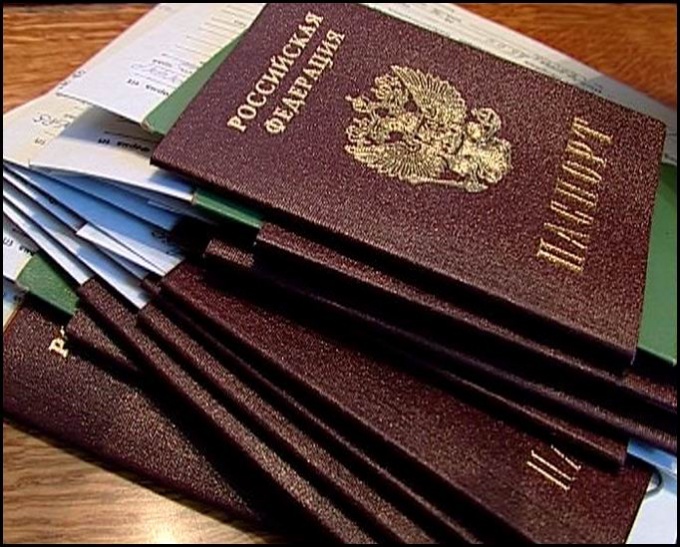 Having a book, kleiv her copies of legal documents, attaching a received certificate and taking with him a passport in the apartment of persons go to the Department of management of Federal migratory service in your region (city). In OUFMS you right in the book in section III prescribed next to each person put down a mark (stamp) stating that the person registered at this address on a certain date. You have to go back to the passport office and hand over the completed house - a book for registration, and then get her on the appointed day. Carry a full package of documents, including the passports of all registered in the apartment people. Before you go to the passport office and OUFMS, check by telephone the time of reception of citizens on questions of registration. If your house book is lost, or data was lost when moving to another residence, or if your home is settled in a compulsory way, or you got an irresponsible organization that lost your house in the book in a never-ending pile of papers, there are several ways to restore the record of the house book. 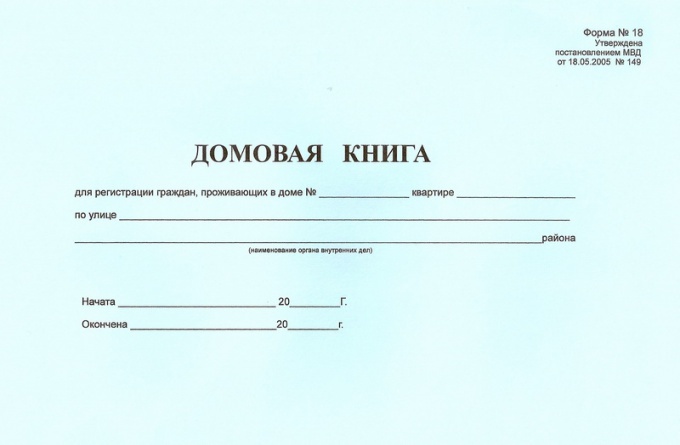 For restore the book of registration, in the first place, contact the PSC (public service Center) on territoriality, a statement in writing of the loss, and also to present a list of the following documents: original and copy of identity card (for restoration of registration at the place of residence of children up to 16 years birth certificate), a certificate from address Bureau confirming the place of your registration, the original and a copy of the document to the dwelling, the original or a copy of the payment receipt for the book registration. This question will help you to solve the rural Council (the authority) and the local passport office, the Federal migration service, in whose jurisdiction is the solution to restore the house book. Besides, in the passport office, is usually a special documentation: account cards, books, household. You may need to apply to the BTI (Bureau technical inventory). The concept of "house book" first appeared in the XVIII century. It was then introduced this document of the administrative account. The brownies book was made by private police officers in each police station of the city and contain the following information about people: name, title, rank, place of residence and family composition. House (piping) book is the only document under which it is possible to obtain information on the composition of persons registered or preserving the right to use the premises of the residential type, belonging to natural or legal persons by right of ownership. When conducting real estate transactions house book (or rather an extract from it) is also necessary-and other legal documents. To get the extract from door-to-door books, you need to write a letter to the billing centre at the location of the property.Brownies books are issued at registration of the population in residential areas owned by citizens in the property, and they are stored either in the housing Department/ condominium (apartment buildings), or in the hands of owners of private houses. Without the house book will be difficult to conduct any actions of the title character (check someone is at home). Door-to-door (house) the book starts in the following cases: the privatization of housing, the purchase of housing under other deals (purchase and sale, inheritance, donation), and at the buyer's premises to write a valid previous book. To purchase this document the owner shall at their own expense.For the decoration of the house book you need to provide to the FMS the following documents: passport, proof of home ownership, title document (contract of privatization, exchange, sale, gift, inheritance, etc. ), an extract from the egrn.Since 2011 in several countries of the CIS (Kazakhstan, Belarus) houses books have been cancelled in order to reduce the workflow in the design of the title and other documents. House book is a document containing information about the owners and people who are temporarily or permanently registered. To conduct house - a book can as the management of the housing Fund organization, and the owners of the premises. If the owner of a house, apartment or room and the management company has a corresponding agreement, the house book will be kept in the organization. Then you need only come and submit their data for registration. If no such agreement exists, the house must be you as the owner of the premises. To get it, contact the local office of the Federal migration service. There you must apply to receive books. To make it will help the employee of the FMS. Before the visit, gather all required documents. Take the passport of the dwelling, as well as the document confirming your right of ownership to it. If you are the owner of a private house, you will need documentary evidence that the land on which the building, you own or lease. Collect the passports of all family members who will live with you, make copies of documents. If you are married, attach marriage certificate. The design of the house, which you receive or buy is established by the Annex to the regulation on the registration account. Opening the Annex No. 11, check whether the signed header and the columns in the book. In the header of the document must be specified building, and apartment number, street name and locality. In the first section shall contain information about the owners of the house or apartment of their surnames, names, patronymics, the period of ownership, the share of the dwelling and its size. The second section of the house reserved for the recording was people in the room. The first column indicates the name and place of birth. The second date of birth. Then mark on the military registration, the data of the passport or another document proving the identity. In the last two columns of table stamped on the formulation and withdrawal of registration by place of residence. In both cases, put the date.